Goodreads: There’s something achingly familiar about Daniel Grigori. Mysterious and aloof, he captures Luce Price’s attention from the moment she sees him on her first day at the Sword & Cross boarding school in sultry Savannah, Georgia. He’s the one bright spot in a place where cell phones are forbidden, the other students are all screw-ups, and security cameras watch every move. 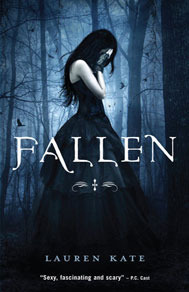 My Reveries and Ramblings: Fallen by Lauren Kate is the first book in the Fallen series. This was the first fallen angel book I’ve ever read and I loved it. The Luce, Cam, and Daniel love triangle was well written. I was always Team Daniel. However, there were times when I became very frustrated with him and wished Daniel was a bit more like Cam. The pacing was a bit slow in the beginning, but I felt it was necessary. It did pick-up, though. The ending was fast paced and suspenseful with a good twist. I finished the novel with several unanswered questions that will most likely be answered in the next three books in the series. Now, let’s talk about the cover art. I love it! It fits perfectly with the story and grabs your attention. If I had come across this book in the book store I would have picked it up.